The Boys Juniors division had five teams competing for bragging rights in the 14th edition of the 18 & Under division. After round robin play, the top 4 out of 5 teams would move forward to the playoffs. As it turned out, the final game of pool play would determine which team would advance into the playoffs, as Boston and Philadelphia each faced elimination. It just so happened that all of the other Philly Suns teams weren’t playing at that time, so a rather large group of Suns fans was there to root on their young brethren and the game turned out to be pretty rowdy. Boston looked to do-it-all wingman Nick Wing to carry the load, while Philly would need to rely on their own top gun, power forward De Lin. Typical of what one might expect from 2 inexperienced teams battling for their playoff lives, this game turned into an energetic mass of bodies diving after loose balls, players holding onto each others’ jerseys, and lots of whistles. The crowd cheered each time bodies piled up on the hardwood, as the hectic game would likely favor Philly’s style of play. In the lowest scoring half in the entire tournament, the midpoint score was 7-5 in favor of the Suns. The low scoring output wasn’t the result of a lack of effort; it was just that everyone was recklessly going 100 mph. All of a sudden, Philly’s De Lin earned himself some time on the bench as a result of some unnecessarily angry words, and Boston saw an opportunity to pounce. Allen Tse registered 6 points for Beantown, and the Knights never looked back, riding a 17-12 win into the playoffs. The reward the Knights would get as a result of the win would be a chance to upset the top seeded, undefeated, and 4-time defending Champion NY USAB Warriors 18’s. But there would be no Cinderella magic this afternoon, as the Warriors took advantage of the spent Knights, taking it easy in a 58-23 walkthrough. Devin Figueroa (18 pts, 4 treys, 2 assists), Kevin Cai (a dozen points and four 3’s), and Kevin Chang (9 points, 4 assists) led the New York assault. The other semifinal was the one that we all wanted to watch, as the 2nd seeded NY Young Life Rockits (2008 Runners Up, 2009 Pre-NACBAIT Classic Champs) would play the 3rd seeded NY ISS Flights. Last year, these two teams had also faced each other in the Semifinals, with the Rockits staging an improbable win as they came from behind for a 24-21 win. That low scoring game saw ISS’ legitimate NACBAIT title aspirations vanish into thin air. 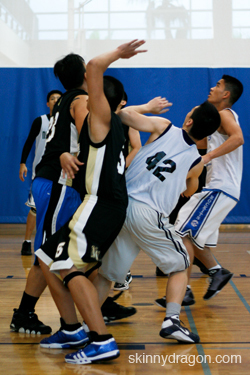 Coach Mike Mei’s YL Rockits came into this year’s Tournament as the one team that had a real shot at unseating USAB. But in this type of situation, no team is going to just say, “Mercy” or wave the white flag. Plus, ISS Flights remembered what it was like last year to have their best chance at a title slip out of their clutching hands in the Semifinals. You know what they say about payback, and Coach Yeung’s ISS was a team with nothing to lose and revenge on their minds. They made it a point to do their best to prevent Jimmy Lau (2-time All NACBA PG, 11 pts, 9-10 ft) from hitting his sweet spots in the lane, and to keep bigman Eddie Zheng (7 points) off the glass. On offense, lanky forward Peter Nguyen (10 pts, 6-7 ft) was the go to guy at the start as he continually took it to the cup and got to the free throw line. The Flights garnered a 7 point lead by halftime, and was thinking upset time. But Jimmy Lau got cooking in the second half, and Cheuk Wong was able to drop some buckets too, as the Rockits pulled themselves back into it. 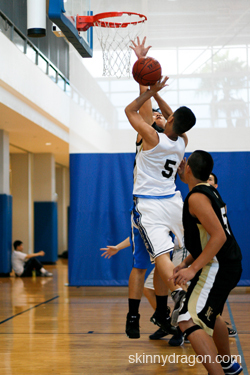 All-Tourney pick Jason Wu (17 pts, 9-10 ft) turned on the afterburners for ISS, as he got into the flow. The Flights put the game on ice, hitting swishing in 12 of 15 free throws in the second half as they advanced 39-34. The Final game between NY USAB Warriors 18 and the NY ISS Flights 18 was somewhat anticlimactic, as USAB proved to be too much for the Flights, 43-26. Jason Wu led the Flights with 10 points. MVP Devin Figueroa (15.7 ppg) had 14 points, Center Osman Ip dropped in 10 points, and SG Kevin Cai (2.3 threes per game) poured in 3 treys. Coach Bill Chan’s NY USAB 18’s have now captured a remarkable 5 consecutive Junior titles, and will look to make it a half dozen next year in Toronto. Fabulous work this year.